Fits most MX and Off-Road motorcycles with 27mm - 62mm fork legs & tubes. Great tool for the shop. Takes the guessing out of making sure everything is aligned and straight. If you do your own fork seals, brakes, or just about any front end work. Isn't it just nice to know you are TRUE. Awesome tool, inexpensive and easy to set up and use. Take out the guess work and get this. 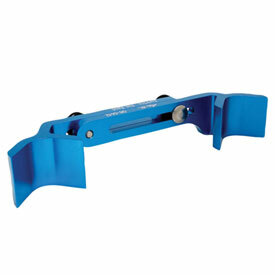 The Motion Pro fork alignment tool is the best way to ensure proper fork alignment. Proper fork alignment will reduce fork bushing and seal wear and also ensure proper fork action. It's super easy to use and gives you the confidence knowing your forks are true top to bottom. This is a great tool to have. It takes the guess work out of fork alignment. after many years of guessing this takes the guess work out of the equation. Love this tool! Simple but great tool used it on my RMZ 450 alighened forks nicely. Easy to use. Well made. Works like described. Great way to check if your forks are aligned. I didn't need to adjust my forks because of this tool, but I use it now that I have it. I'm not sure if I used it right but I tried it on three bikes that have crashed and never been aligned and they seem to be true. It does a good job of comparing the top and bottom distances but is a big bulky when trying to fit it through the spokes. It does what it needs to. Although I don't know if I really needed it. I have taken the front wheel off twice since I've had this. Everytime I use it to check the fork alignment it's good to go when following the service manual. Most bike have the correct spacer on the front axle so when you tighten down the axle nut the forks should be parallel. It does give you piece of mind though. If you mix up the spacers this will catch it. this is a great tool to have and to use. its simple and comes out even on your forks every time. I eye balled the fork tubes then used the alignment tool. I was off quite a bit. Even compressing the forks prior to tightening the pinch bolts did not get the forks perfectly paralled. This tool is pretty easy to use. I have more confidence the tubes are parallel now. My seals and bushing will last longer since there is less side load. with this tool you can know for sure your forks are parallel! easy to use. no binding. motion pro makes high quality tools!! I have finally come to see the importance of having the forks parallel and this tools helps to make it happen.